A Gate Opener site that opens new doors for do-it-yourselfers. Surge suppression is the single most important protective measure for a gate opener control board. Nothing can stop a direct lightning strike, but small surges happen all the time. The two largest sources are residual energy from lightning nearby and power overages when the power company restores power after an outage. These surges can destroy a gate opener control board, leading to costly repairs. One of these supressors is sufficient for a gate opener with one more acessories that connect to the same opener and don't run off the power from the opener or opener's battery. 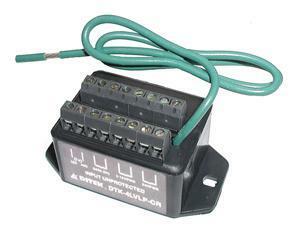 Two are necessary if the gate opener and accessories run off the power of the control board, or if the accessories connect to different terminals. Dimensions: 2.90" x 1.62" x 1.58"
© Copyright 2002-2019 Web Direct Brands Inc. All Rights Reserved, We Serve Worldwide.